Discussion in 'Downhill & Freeride' started by ???? ?, Dec 6, 2012.
Who knows much about Socom cranks? I'm looking to upgrade the cranks on my Socom frame with the 150mm rear end, but I'm not sure which cranks will fit properly because of the 73mm bb shell. I have the older style LG1 wide chain guide and am running 9spd. I would like either X.0 or Descendent cranks with a 165mm arm length. I'm not sure if Descendants are available in 73mm but I know XO DH are. The Descendants are available for 73mm. It really depends on what you want and how much you're willing to drop on a set of cranks. Yep, slightly heavier but cheaper and dependable versus light but pricy and the potential to snap. Why not saint 810? You can pick them up cheap now that the new stuff is out. I would also consider Saints. Mostly I'm just not sure which size I need because my bike has a 73mm bb and a 150mm rear axle. The cranks on it now are Holzfeller OCT's with a 56mm chainline Howitzer bb. Looks like a single ring M810 will get you a 50.4mm chainline. Using a two piece crank like the 810 will provide less chainline adjustment than your current setup, from what I can tell. you cant tell me that whatever it took to do that would leave an aluminium crank arm undamaged. whatever happened to snap that carbon crank arm would have broken or bent just about anything. I'm yet to see a saint break like that. There are quite a lot of catastrophic failures on x.o's but I'm yet to see it on saint. it may not "snap off" but an impact that would cause a carbon crank to snap would at least bend an aluminum crank. Will this ( http://www.raceface.com/components/small-parts/bottom-bracket/83-to-73-68-kit/ ) let me use an 83mm X.0, Descendant or Saint crankset and still give me the right driveline spacing? Thanks for the e-speculative insight. 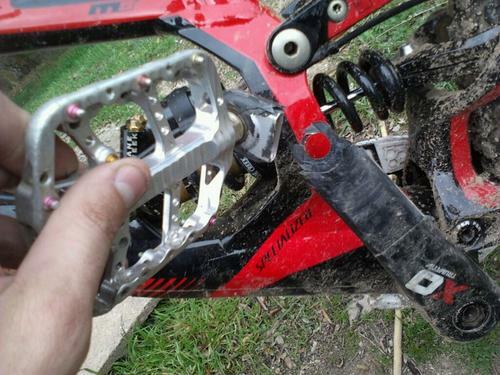 That wasn't my pic, but there are 2 known failures of XO cranks like this that I'm personally aware of. The pic I posted I found on-line and had the description that it snapped in a g-out. My friend Tyler snapped a pedal off XO's sliding out in a turn. Small crash. Saw it on video, and had to personally replace the crank with his friends Hive cranks so he could do a race the next day... It was fun clamping the remains of that aluminum pedal insert into a vice so he could have his Podium pedal back. The carbon is only 1 pixel thick! The only bent saint cranks I know of is from local dirt jumpers learning to do 360's of drops. I'm willing to give XO DHs the benefit of the doubt by figuring those were a small batch of manufacturing defects. After all, the majority out there are spinning along fine. It does raise the possibility though as opposed to Descendants or Saints that are more bullit proof. As for chainline, do any of these 68/73 DH cranks allow chainring mounting in the "big ring" position rather than just the standard "middle ring"? That would give a good chainline with a 150 rear end. How about some Sixc from raceface? I did a bit more reading and it sounds like any 83mm crank will work, but I need to space the BB out so that it fits correctly in the 73mm BB shell. I'm leaning towards the Saints now due to the high cost of the X.0's. The advantage of the X.O's being about 200 grams lighter is tempting though. Will the bb thread far enough into the 73mm Socom frame with the spacers needed to make the 83mm spindle work for the 150mm rear axle? Are you talking about spacing the BB cups or a spacer on the crank axle (http://www.raceface.com/components/small-parts/bottom-bracket/83-to-73-68-kit/)? I spaced out a set of 83mm RaceFace Evolve cranks by the BB for a 68mm Remedy...it was sketchy at best, 5-6 threads per cup. That was also with a RaceFace BB, which had very deep, if not the deepest BB cups. I'd use a 68/73mm crankset hands down. Put all the BB spacers on the drive side and mount the chainring on the outside of the tab. If the chainring needs to go further out use some chainring spacers. I don't see a problem with using an 83mm axle and putting spacers on the axle between the cranks and the BB. I'd rather have narrow cranks (73mm SixC) with the chainring in the outer position. Hmm... so what cranks are being used on Socom's with 150mm rear ends? I know the frame is a few years old, but there still must be some other bikes with a 73mm BB and a 150mm rear end. I have Truvativ Holzfeller OCT's with the Howitzer 56mm BB and it works perfect, other than the pedal threads on the drive side crank arm are stripped and it's a heavy tanker of a BB so I don't really want to buy another Holzfeller OCT crank. Surely there is another 'correct' BB and Crank option for this bike.